San Francisco events April 2019. Things to do in San Francisco. We recommend the best events, festivals, and fun things to do in San Francisco Bay Area. Mileage is from San Francisco City Hall. Wear a costume to St. Stupid’s Day Parade, which starts at the foot of Market Street and follows a route through the financial district. Bring socks to toss at the Stock Exchange and pennies to leave at the Bankers Heart. Free. See spectacular arrangements of flowers from around the world and attend scheduled events at Macy’s Flower Show at Macy’s in Union Square. The 2019 outer space theme “celebrates the wonder and mystery of the cosmos.” Free. Hear Grammy-winning jazz artists when Monterey Jazz Festival on Tour stops for an evening at Zellerbach Hall in Berkeley. Enjoy finger foods and local vendors while your dog sniffs out eggs filled with tasty treats and prizes at the Easter Egg Hunt for Dogs in three locations (S.F., Oakland, Redwood City). See the Grand Slam Finals of Youth Speaks Teen Poetry Slam held at Sydney Goldstein Theater. Celebrate Scotland at Tartan Day Scottish Fair with music, dancing, bagpipes, handmade crafts, historical re-enactments, a children’s area, and meat pies at Ardenwood Historic Farm. Kilts welcome but no dogs. Taste dozens of beers, vote for your favorites, sample food from local restaurants, and hear live music at Battle of the Brews in Grace Pavilion at Sonoma County Fairgrounds for age 21+. Visit 15 art studios displaying works by 100 artists during Mission Artists’ Spring Open Studios. Free. The scenic Rock ‘n’ Roll Half Marathon San Francisco begins at Ocean Beach, crosses the Golden Gate Bridge, has live bands along the way, and a finish line concert at the Civic Center. The picturesque gated community of Pebble Beach Resort is the site of hedonistic Pebble Beach Food & Wine, which offers epicurean events featuring 250 wineries and 100 chefs. Visit merchants on Polk Street from Jackson to Post to sample wine and appetizers with your ticket to Polk Street Spring Wine Walk. Held in April, July, and Sept.
Shop from 100 vendors of fine antiques and decorative arts ranging from the 17th century to modern day at the Hillsborough Antiques + Art + Design Show at San Mateo Event Center. Repeats in November. San Joaquin Asparagus Festival has asparagus dishes to eat, a craft fair, a petting zoo, entertainment, and carnival rides at San Joaquin County Fairgrounds. Cesar Chavez Holiday celebrates the life and work of the famous Mexican-American civil rights activist and union organizer with a parade leaving Dolores Park at 11 a.m. and ending at a street fair on 24th Street (from Folsom to Bryant). Free. Eggstravaganza is a family-friendly event with egg hunts, carnival rides, games, live entertainment, kids’ activities, and a BBQ competition at Robin Williams Meadow in Golden Gate Park. Read the web page to buy tickets in advance (kids age 2 and younger free). No pets. Sample 150 artisanal ciders from throughout the world with food samples during Cider Summit S.F. at the Civil War Parade Ground in the Presidio. Children may attend with their parents. Easter Love Reach has egg hunts up to age 12, face painting, craft-making, entertainment, and a petting zoo at Bushrod Park. Free. Offering lots of “activities that spark curiosity and ignite creativity,” family-friendly Tinkerfest lets you dismantle cars and a plane engine, build drawing robots, make a drum, build a doll, weave, and event solder at Chabot Space & Science Center. Big trucks with big wheels create big excitement at Monster Jam at Levi’s Stadium in Santa Clara. Enjoy craft beer, bacon-inspired tastes from local restaurants, music, and interactive games at Bacon and Beer Classic at Avaya Stadium. Cuba Caribe Festival presents Cuban social dances at Brava Theater, plus a reception with artists at Museum of the African Diaspora. Buy creative grilled cheese creations from 20 vendors during S.F. Grilled Cheese Fest at SoMa StrEat Food Park. Optional unlimited craft beer. Free admission for children age 10 and younger. Taste wine from 150 California vintners at SF Vintners Market at City View at Metreon for age 21+. Repeats in Nov. Renegade Craft Fair has indie crafts, food trucks, craft cocktails, DJ music, and workshops in the Festival Pavilion at Fort Mason Center. Repeats in July and Nov. Free. Celebrate the blooming apple trees at Apple Blossom Festival, which includes an old-fashioned parade (Saturday 10 a.m.), live blues on Sunday, and a street fair with food and craft vendors both days in Sebastopol. Walk, bike, or roller skate on a city street when most cars are banned for Sunday Streets, which are held about once a month from March to October. Enjoy drinks, hors d’oeuvres, dance performances, and a silent auction at One Love, a benefit for the Hip Hop DanceFest at Dance Mission Theater. Celebrate Easter by hearing and/or singing Handel’s entire Messiah with a full orchestra in Los Gatos. Register free online. Pairing Wine with Tzedakah features 14 “California wineries connected to the Jewish community” with appetizers at San Francisco Film Centre for age 21+. Taste features 20 local chefs making “artfully inspired bites and cocktails” with a silent auction to support charity at Root Division on Mission Street. Actors portray historical figures on Free Tours of the Yerba Buena Neighborhood, monthly through August. A yoga apparel company devastated by a scandal devises a surprising plan to save the company in Yoga Play at San Francisco Playhouse. Watch actors read the scripts of new plays written by “up-and-coming Bay Area playwrights” during Lights Up at City Lights Theater in San Jose. With devastating realism, The Jungle recreates the short-lived, self-governing society that emerged within a sprawling refugee camp in Calais, France and the intimate stories of its residents at the Curran. Billed as the longest-running film festival in the Americas, San Francisco International Film Festival screens 180 films from 50 countries, awards prizes, and holds parties, panel discussions, and classes. CityPass gives you 5 attractions for $95. Witty drama Vanity Fair exposes a society that cares more about good birth and manners than about skill and good character at A.C.T.’s Geary Theater. Master magician and mentalist Jay Alexander entertains with comedy, sleight-of-hand, and human lie detection at Marrakech Magic Theater, with optional appetizers and cocktails for sale. Reviews. San Francisco Bay Cruise Adventure takes you on a scenic one-hour ride from Pier 39, under the Golden Gate Bridge, and then around Alcatraz. A Paris Love Story stars Hershey Felder, who brings the impressionist composer Claude Debussy and his music to life at Mountain View Center for the Performing Arts. Sail aboard The Privateer with 2 drinks from Pier 39. Entry is free at Muir Woods National Monument and San Francisco Maritime National Historical Park on Free Entrance Days in the National Parks. Expect more people and less parking than usual. Earth Day San Francisco has live music, keynote speakers, organic food vendors, an eco fashion show, and an eco kids’ zone on Valencia Street (from 19th to 20th). Free. 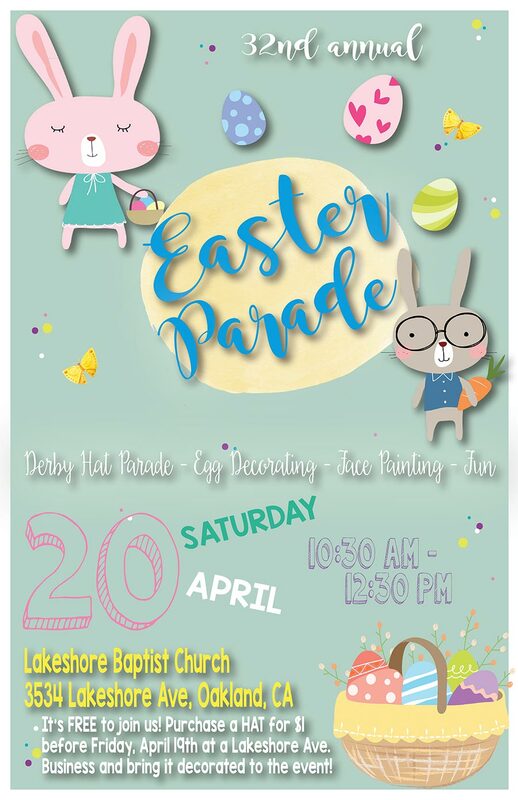 Bring a decorated hat to wear, and join the 11:30 a.m. parade, with face painting and treats during the Easter Parade & Spring Festival at Lakeshore Avenue Baptist Church in Oakland. See the poster. Children make patterns on eggs with brilliant plant-based colors at the hands-on workshop Naturally Dyed Eggs at UC Botanical Garden. Help clean up the beach and then create sculptures from sand, rocks, shells, and seaweed while musicians and dancers perform at the Earth Day Celebration at Stinson Beach. No dogs. Free. Big Bunny 5K has awards by age category; the Kids’ Fun Run has medals for all at Cupertino Civic Center. Bunnies and Bonnets Parade has marching bands, animals, and dancers going west on Campbell Avenue (from Railway Avenue to 3rd Street). Free. Throw brightly colored flour, dance to DJ music, and eat Indian food to celebrate the spring festival of Holi. Northern California Cherry Blossom Festival includes food booths, performances, martial arts, a pop-culture area, and live bands, plus a Grand Parade Sunday at 1 p.m. from City Hall to the festival in Japantown. Free. OpenTable lists restaurants that offer special brunch, lunch, and dinner menus on Easter weekend. Select a morning hour to see brunch availability, or select an evening hour for dinner. Union Street Spring Celebration and Easter Parade has kids’ activities from 10 a.m. to 5 p.m., plus a 2 p.m. parade on Union Street (from Gough to Fillmore). Free. Take an Easter brunch or dinner cruise with views on a Hornblower Yacht, departing from Pier 3 or Berkeley. Sisters of Perpetual Indulgence offer entertainment, an Easter bonnet contest, and “Foxy Mary” and “Hunky Jesus” contests at Golden Gate Park. Free. Berkeley Earth Day promises “inspiring speakers, music, upcycled crafts, veggie food, and dozens of eco-vendors” at David Brower Center. Free. Sample local wines with small bites at “about 20” participating businesses on Gourmet Ghetto Wine Walk, which includes a wine glass and supports charity. Wear cocktail attire to The Speakeasy, a 1920s watering hole with multiple rooms of bootleggers, bouncers, war veterans, and barflies put on by Boxcar Theatre behind a secret door in North Beach. Remember those timepieces your parents used to wear on their wrists? See a huge assortment at the Wind-Up Watch Fair at 459 Geary Boulevard. Free. London-born actor David Payne brings the witty author to life in his one-man show My Life’s Journey: An Evening with C.S. Lewis. Hear about his friendship with J.R.R. Tolkien, why he nearly abandoned the Narnia Chronicles, how he came to embrace Christianity, and how an American woman turned his life upside down, at Marines’ Memorial Theatre. The Startup Art Fair showcases contemporary art by 60 independent artists in an intimate setting at the Hotel Del Sol. Browse contemporary and modern art at Art Market San Francisco, which features 70 galleries in the Festival Pavilion at Fort Mason Center. Hear lectures on health and spirituality, and meet vendors of ecological, green, and holistic products and services at New Living Expo in San Mateo Event Center. Choose from 60 field events, including nature walks and workshops, during Point Reyes Birding & Nature Festival at Point Reyes National Seashore and surrounding counties. Some events sell out early. Attend hundreds of performances, classes, and workshops during Bay Area Dance Week. Free. Watch live honeybees, buy honey, make bug-related crafts, touch live exotic insects, see insects under microscopes, compete in the Insect Olympics, and maybe even eat a bug during Bug Day at Randall Museum. Free. More than 30 Mendocino wineries and food producers are headed to San Francisco to give you a Taste of Mendocino at Fort Mason Center for age 21+. Follow a hilly loop trail around Angel Island State Park (either once or twice) with stunning views of San Francisco and the Golden Gate Bridge at Romancing the Island Half Marathon & 10K. Meet baby goats and lambs, feed chickens, watch sheep shearing and goat milking, see bees, make crafts, hear live music, buy food for sale, walk the trails, and enjoy ocean views during Spring Fling at Slide Ranch. Petaluma Butter & Egg Days features a noon parade, arts & crafts booths, live music, a beer garden, and a kids’ area in downtown Petaluma. Free. International Children’s Festival features dancers from 25 countries, pony rides, bounce houses, a petting zoo, and international food at Discovery Meadow. Free. Cupertino Cherry Blossom Festival [sound] features Japanese food, arts & crafts booths, entertainment (taiko drums, dancing, martial arts, music), cultural demonstrations, (tea, origami, flowers, bonsai), and a children’s area, indoors & outdoors at Cupertino Memorial Park. Free. San Francisco Decorator Showcase features the work of dozens of local interior and landscape designers in a 1904 remodeled home at 3800 Washington Street in Presidio Heights. Closed Monday except Memorial Day. Opening Day on the Bay marks the official start of boating season with a blessing of the fleet at 10:30 a.m. in Raccoon Strait, followed by a colorful parade at noon of 100 boats moving along the waterfront from Crissy Field to Pier 39. Press release. Free. Glen Park Festival is a low-stress event with live entertainment, jump houses, and craft and food vendors on Diamond Street & Wilder Street in quaint Glen Park. Take BART to Glen Park station. Free. The annual San Francisco Festival of the Mandolin this year features “a tribute to San Francisco’s special history of Italian mandolin masters” with a 1 p.m. concert, workshops, and ethnic food at Croatian American Cultural Center. Pacific Coast Dream Machines Show is a macho dream with cars, airplanes, motorcycles, and even tractors on display, plus stunt shows, kids’ activities, food vendors, and live music at Half Moon Bay Airport. Northern California Ukulele Festival has performances, workshops, food booths, and arts and crafts at James Logan High School in Union City. Vintage and antique lovers will find an eclectic variety of items available from 200 dealers at the Petaluma Spring Antique Faire. Repeats in September. Free. Watch dozens of groups perform a wide range of dances (including hula, modern, jazz, and salsa) lasting about five minutes each at sjDANCEco Festival outdoors at Santana Row. Free. Golden Gate Park Band plays a variety of music (classical, marches, opera, swing, and show tunes) at Spreckels Temple of Music in Golden Gate Park. Free.